Whether you are a beginner or professional skateboarder, having the best skateboard bearings are one of the most essential parts. If you have a high-precision and long-lasting bearings, chances are you will have lots of fun with your friends. 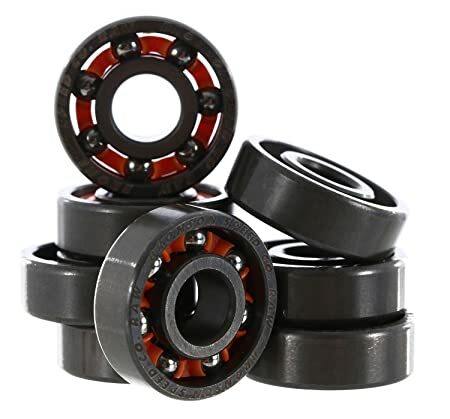 I will help you to browse the best performance skateboard bearings that match your needs. This list will save you lots of time to go through the ocean of bearings in the market. So, what is so interesting here? Below is a comprehensive guide for you to pick the best bearings type. Along with it is my updated list for bearings options. 1. How to make bearings spin faster? 2. How to clean ceramic bearings? 3. How much do bearings cost? 4. Ceramic bearings vs. steel bearings. Which ones do I need? 5. How to remove bearing shields? 6. What are the fastest skateboard bearings in the world? 7. What is the best ABEC for skateboard bearings? 8. What is the difference between ABEC 7 and ABEC 9? 9. What is the difference between ABEC 5 and ABEC 7? 10. What are the best Bones bearings for the street? Bones reds vs super reds? Let’s get started with the general role of bearing! Bearings are the round metal pieces that go along with your wheels. They help to mount your wheels into the skateboard truck’s axles. The balls inside of each bearing are the key factor for your wheel to turn. You should know that the bearings universal measurements are usually 8mm (core), 22mm (outer diameter), and 7mm (width). As you might discover that each bearings box or set usually come in a total of eight pieces. Each wheel should have two bearings in assistance to it. Regardless of the type and size of your wheels, you should be aware that the standardized bearings are likely to fit most wheels. So don’t worry too much about the size, but rather their prices, materials and might be also the ABEC ratings. More on this information to choose the best skateboard bearings later below! So keep reading and let jump into the review first. Do you want the best skateboard bearings right? Here is the get-go! Everyone in the skateboarding community should have heard about the brand Bones when it comes to bearings. I was amazed that Bones has been around since the 1980s. Bones’ manufacturing quality is famous all over the country. It is the veteran who still excels in the today competitive market. Currently, they are offering two major product lines: Bones Swiss and Bones Reds. Hence you arrive at the very best of my top list, the Bones Swiss Ceramic. The company does not use the conventional ABEC ratings for any Bones bearings. Since its quality is the top notch that even above the ABEC ratings. I will let you know more about the ABEC story, let save that detail for later! Over 25 years of experience, Bones can ensure the high-performance requirements of the skateboarding community. Every Bones’ bearings will have its specialized speed lubricant applied for your convenience! These bearings have the premium ceramic materials and follow the top precision-grade Swiss design. You definitely can’t go wrong here! Ceramic is far more superior compared to steel bearings. They reduce the rolling resistance on the wheels, hence, increase the precision for the balls inside and make the wheel roll faster. The ceramic balls are lighter and roll better at least 3 times compared to steel balls. Along with that, Bones offers spacers included between the two bearings. This aims to keep the bearings parallel and stable altogether. You can’t even imagine how smooth they roll, even on cheap wheels! If you are looking for the best pick, I highly recommend you go straight to Bones! Too expensive for you? Don’t get upset if you can’t afford the top bearings! This Super Swiss bearing is a bit different than the previous one. Hey, it is the second best bearings here, which definitely worths every penny you invest in. Watch out though! This is a steel bearing in contrast to the ceramic type. You will glad that thanks to its reasonable price starting at $64. What is the major benefit here? The design construction is also slightly improved in compensation for the speed. As the word “Super” implied, you got the balls inside these bearings are larger than other normal types. They help you to get top speed faster. The more acceleration, the more fun! Right? The Swiss construction will guarantee you have a lifetime warranty against all defects. This is also part of the reasons Bones does not use the ABEC ratings to determine its bearings quality. Bones, of course, has included the Bones Speed lubricant to its products as they arrive at your doorsteps. You are well deserved for those benefits since you pay a premium price! If the ceramic bearings are too expensive, this is the second best choice for your consideration. Of course, please aware that steel bearings are not resistant to moisture. These steel bearings will wear out faster compared to the ceramic one. There is also a single rubber shield in place to strengthen the bearings’ speed and reduce frictions. You can easily remove them and clean the inside components. If you don’t know how to clean your bearing, keep on reading. I will reveal the method later on! As for these bearings, they are the original design, of course, made in Switzerland. You probably won’t feel the difference between the super Swiss and this original Swiss. The original Swiss bearings have the normal size balls inside. This is a balance between speed and precision. Also, they come with four bearing spacers, extra stability at your service! 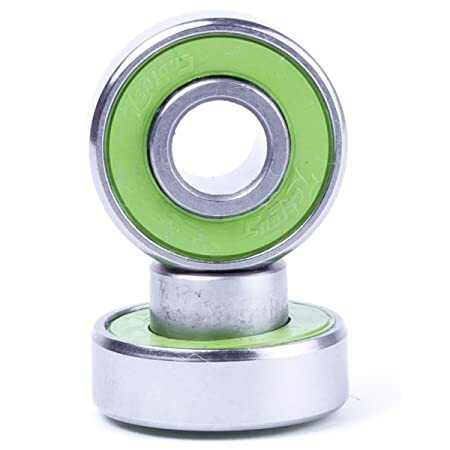 These spacers mainly help the two bearings staying parallel and become stable while spinning. Obviously, there are rubber shields and Bones Speed cream applied inside to sustain the components over time. Other than those above, there won’t be many differences left. The price tag is also similar too. For the material quality, you can rely on the brand reputation and its manufacturing standard. The business has been around for decades, Bones quality is impeccable! Remember that I have told you about Bones’ second product line called Bones Reds for more affordable prices. Here I present you the Bones Ceramic Super REDS! They are lighter and provide faster acceleration compared to most steel bearings in the market. These bearings have all the material benefits except the Swiss design. If you don’t really care for where these bearings are from, then pick this one instead to save some money! What is the difference if these don’t have the Swiss design? Well, from my research, Bones makes it REDs bearings from Asian countries to reduce the manufacturing cost. Bones has its factory in China too, the brand controls very well the manufacturing process for creating the top quality bearings. These ceramic bearings reduce friction and are faster than steel bearings, even with or without lubricant! You should know that ceramic won’t get rusty or easily damaged by dirt. Off you go! No worry about frequent maintenance. 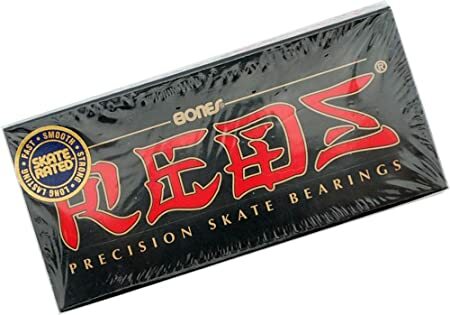 If you are starting out your skateboarding career, the Bones Super REDS or REDS might be a safe choice for a low budget. I really feel ya! Hey, I used to be like you during high school, saving my breakfast money for skateboards! These links above are several alternatives options that might fit your reference. They are high quality, and definitely than enough for your needs for speed. They are steel bearings with normal size balls for the REDS design and slightly bigger balls for the Super REDS design. So if you prefer faster acceleration, pick the Super REDS design which is also slightly expensive around $3-4 bucks. If you prefer a balance of speed and control, then I suggest the REDS design is the right pick for you. The benefits of Bones steel bearings remain the same as I have mentioned earlier so we don’t need to go over them again. Saying goodbye to Bones, you now arrive at the more affordable options with the average price range. Let’s kickstart with Yellow Jacket! I hope this brand is another affordable pick even for professionals too. With German manufacturing, the brand gives you a wide variety of designs and color choice for you. They use the premium steel material that improves the smoothness for every spin. The fact is you can barely hear the spinning noise from these bearings! 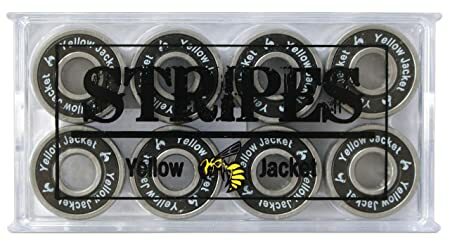 These bearings have two variations, one has the stingers design at ABEC-11 and the other has stripes with ABEC-9 ratings. Think the ratings as the quality of manufacturing the bearings. The higher ratings the better precision and more RPM you will get. What I love from this brand is they offer hassle-free money back guarantee. If you don’t satisfy with the speed these bearings they provide, you can have a full refund with no question asked. This Bronson Speed Co. comes very near to the top ranking bearings. The shieldless design does bring you to the next level. It also has some advantages. Bronson’s professional teams do 100% hand inspection twice for the quality of each bearing. The company even has these bearings under micro-polished and ultrasonic solvent washed. You can rest assure that they both look and feel smooth during any tricks and performance. These bearings are well-maintained in nitrogen packages. This method is to keep metal and oil oxidation until you get your hands on these bad boys. You don’t need to worry about these bearings’ quality. You can hear the raw and joyful sound from those bearings spinning while you skate. This is so unique that most normal bearings won’t offer. I think you can also clean those bearings without any struggle. These next two bearings are from Bronson also. They are under two styles for your selection when checking out. But stay with me as I make it short for you! Unlike its shieldless brothers, these are the new generation with the new design. Each generation has a certain trait that is competitive technically. Straight Edge Frictionless Shields – these shields are pop resistant, completely seal tight. They can keep the oil inside while deterring any dirt and moisture outside. High-Speed Ceramic Oil – this is the key element to prevent rust and corrosion affecting the balls and steel materials inside. ABEC 3 ratings – low precision, average smoothness, and less response. Factory Fresh Quality – the package arrive with nitrogen filled, keep the metal & oil in good condition until you open it. Certain people report these don’t give much difference or competitive edge in speed. You will feel on fire with these bearings! Spitfire is also one of the most reliable brands in the community. Its products are well-known for reliable quality. 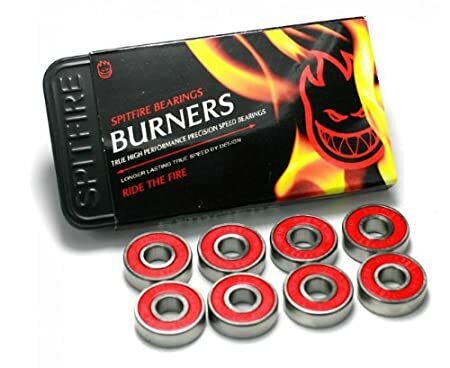 The Spitfire Burner bearings are heat-resistant which surprise me compared to ceramic bearings. All thanks to the high-carbon chrome steel materials. Don’t you take the affordable cost and simple look by mistake! These bearings have their customers speak for themselves. 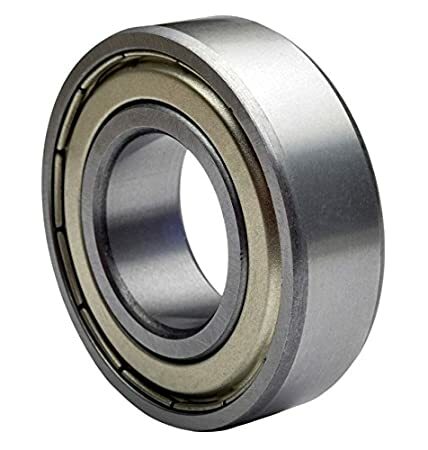 Many people really enjoy these bearings over the years without having any issues. As long as you keep these bearings clean monthly, you will realize how great they are through everyday practice and testing new tricks. Why don’t you give them a try? 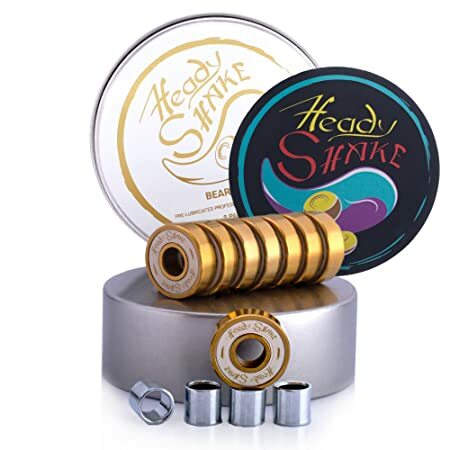 Let’s focus on more speed with this Heady Shake Pro bearings. If you travel on a longboard or cruiser quite often, these baby is definitely the right combination to your skateboard. The brand optimizes them for speed and smoothness in overall testing. You can’t go wrong for choosing Heady Shake. The bearings are ABEC-9 rating which meets the top precision you could have asked for. Combine that with some lubrication, you will enjoy your smooth rides and top speed without a doubt. In addition, the bearings are also very quiet when rolling in many types of wheels. They are totally efficient and designed for long-term riding experience. The titanium coating, waterproof stickers, and double strengthened retainer also enhance their overall toughness. You won’t regret investing in such a reliable brand like Heady Shake! Hey, want to have something neat and convenient? Neal bearings are very affordable and earned much love from skateboarders. The brand also offers three different variations that suitable for your needs. When you come to Neal bearings, the price is definitely worth the quality offered. Neal manufacturing manages to get these bearings up to ABEC-9. So you don’t have to worry about the super speed from these. But how you should pick is a different story! The Ceramic bearings are for competition and advanced tricks. They are reliable and super fast, all thanks to the friction reduction features. 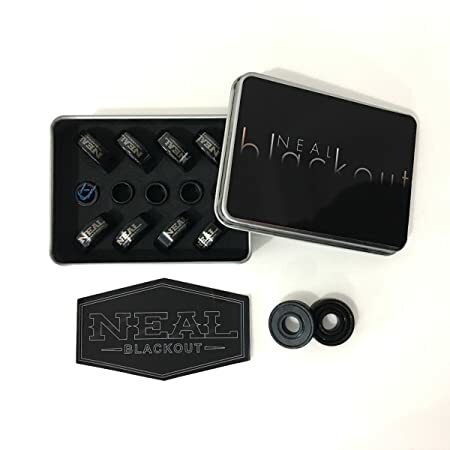 The Blackout bearings are one of the top product lines. They are less susceptible to moisture compared to other materials. Then we have the Titanium Stinger. These are harder than other steel bearings obviously. The speed is slightly slower than the ceramic one and gives more control over your tricks. Lastly is the standard Swiss grade. You will happy if you are a beginner. The speed is decent and the bearings are also long lasting too. Might appear as a cheap brand. This part is best for those are on a tight budget! Cheers! I highly recommend you consider the SCSK8 bearings from this rank below and onward. Though they don’t consist of high-quality materials, they will do the job just fine! SCSK8 is an uncommon brand that also makes high precision bearings. I believe they will serve you well! Its bearings are steel and come with pre-lubricated oil. The lube should be adequate to maintain the balls and ensure your performance. Their special feature is those element rubber seals. These seals should prevent the moisture and dirt from entering and keep the lube inside circulating around. You can’t help pick them up just for $15 bucks! That is such a good deal! Similar to Bones, Mini-Logo is also a popular brand which brings many benefits to the skateboarding community. Their bearings are also Skate rated. You hear me just fine! Let me explain. Even though the manufacturing process got the best rating, the material quality falls short. This is understandable for the $13 price tag. 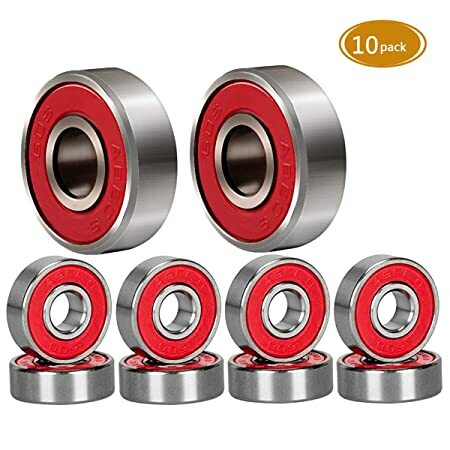 Should these bearings consist of high-quality steel, they won’t come with a cheap price for you. Hold with me on this. I still give a good recommendation that they have double rubber shields. You can remove both sides for easy cleaning. These bearings also come with the Bones speed lubricant that I mentioned before. Yep! Skateboard brands do works together and bring you great products! Considering these are good bearings for you to start practicing is fine. They are affordable and have a lifetime warranty in place if you ever doubt about their quality. This might be my unusual pick, the Shake Junt bearings are very smooth for those love cruising on your skateboard. The ABEC-7 is the average manufacturing standard so it is fast enough for beginners to get acquainted with. These are also pre-lubricated when you first purchased, pretty neat huh? The main thing people bought these bearings are for the good-looking stickers. You can browse those bearings for many different types from its store. So definitely worth for you to take a look! They are also affordable starting at $21 bucks. 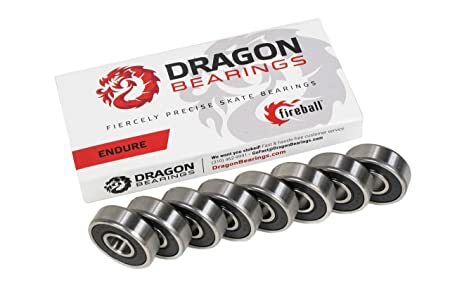 Let’s get into beast mode with Fireball Dragons bearings! These bearings will set your trail on fire with two variations: Endurance and Race. Worry not on the quality as the brand hires the expert designers for these two types. The Race type is light and designed with low viscosity oil. Experts have optimized the oil for your ultimate speed and best performance. If you focus on high speed and spinning performance, why not considering Fireball Dragons? The Endurance type uses a slightly thicker lube, so you don’t worry too much about the frequent maintenance. These are best for those longboards and cruisers. Besides the amazing construction, they also have dual labyrinth shields to protect the inner bearings from dirt. You also have the “Beast” guarantee on all Fireball products. A full refund might be possible if you don’t satisfied with any types! Oust also offers a unique design that even bring smiles on your face while skating. The High Rockwell material and fancy surface polish help your speed in overall. You can carefree about the durability, as their strict design and materials can handle most of those nasty frictions. There are also two removable buna rubber seals on each bearing, which provide extra protection from moisture and dirt. Don’t underestimate their ABEC-5 rating though. Again, this is not the main indicator of brand quality. They are made in the USA and under the MOC 5 Tech manufacturing processes. You won’t see the Oust’s potential until you try them! Everything is to give you the best quality for the bang of the bucks. What I personally like Zealous bearings is that it has lots of interesting stuff for an affordable price. For example, they offer two types either ceramic or steel just so flexible for you. If you are looking for cheap ceramic bearings, here they are! In overall, the bearings have built in spacers and speed rings. You won’t have to struggle with small parts losing when you clean frequently. Thanks to those as well, they largely reduce the friction and enhance your fast wheels. The bearings also have rubber seals to protect the inner parts from debris. Moreover, you will love the premium lubricant applying to every bearing. The Nanoceramic Grease will smooth out the metal parts inside, hence improve your speed! So corrosion won’t be your problem even if you buy the steel version. The beginners can start with steel bearings while a pro will likely pick the ceramic one. Got to love them for the cheap price! Both fit for beginners and professionals. 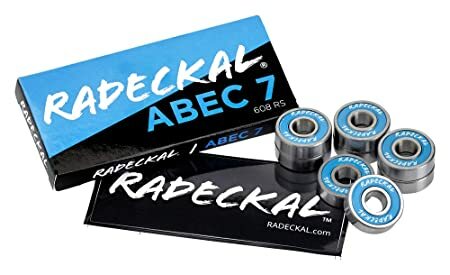 Radeckal offers an ABEC-7 rating for many types of skateboards. Though these bearings are more lean toward longboards and cruisers. This brand will bring you the smooth glide that you wish for. You are fine with the material quality for a long period of time, pretty neat for daily traveling. Also, these bearings come with pre-lubricated oil to maintain the internal parts. This will definitely increase your speed on every journey! 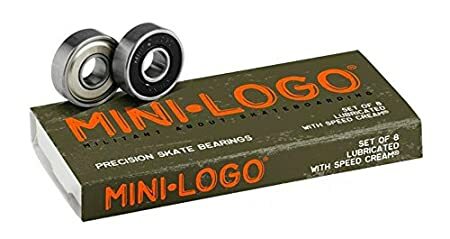 These bearings have a simple design that fits well on most boards, cruisers, and mini skateboards. If you just prefer plain and simple, these are definitely a cost-effective solution for you. Suitable for beginners and fit for most skateboards. Think about this for seconds! Spruce is also an affordable solution if you want more speed. The brand even claims to have ABEC-9 and 11 high-speed bearings. You should test them before buying, watch out for the amazing speed! Since the main material is carbon steel, the low price might indicate low quality and the bearings might not last long. These bearings are up for speed, as the brand constructs them to be super fast and smooth. All thanks to the hard steel ball and nylon cage, you are ready for a smooth roll downhill. The red seals are quite durable and hold tightly to avoid dirt and moisture invasion. 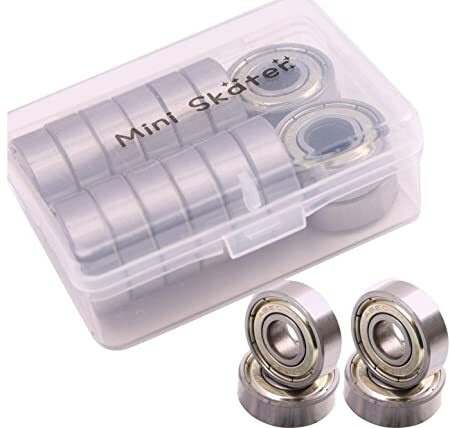 You can also take advantage to use these bearings for many types of skateboards too. Don’t worry if you doubt the quality exchange for the cheap price. Spruce has 30 days full refund if you are not happy. So don’t hesitate to try them out! I present you these bearings. They should be super cheap if you really don’t mind the quality. I understand certain people would buy things that work for now. They will consider an upgrade later when they get gnarly. So these bearings are good if you want to give a test for practice purposes. They are carbon steel, so the durability should be enough even for heavy loads. The bearings also have radial loads support in place just for you! Allowing to get more weights or strong impacts when landing. Besides, they already have lubricant insides, and they come in a pack of 10 for extra replacement. How good is a deal is that! Again, this would fit most skateboards out there so just don’t mind to test their limits since they are quite cheap. Quite similar to other cheap bearings, I empathize for those have a tight budget. Mini Skater is another alternative for you here. The best part is they come in a pack of 16 bearings at $8. These bearings might not take a lot of beatings on the dirt, yet they suit for those who are busy with other important works. It is wise not to invest too much if you don’t have time to skate frequently. These bearings are the good place to start with decent 608zz durability. They also have lubricant ready inside. So you can still enjoy the smooth ride and basic tricks that requires average speed. Perfect for beginners to try out new tricks and taking it slow. Lastly, even though it is not the best choice, but it was what I started skating from the start. They can last for months before giving up on you. EsKape also made decent speed ABEC-9 rating bearings. They would be fast enough for many beginners here, and also fun to skate on. These also come with lubricant ready inside with good shields for protection. 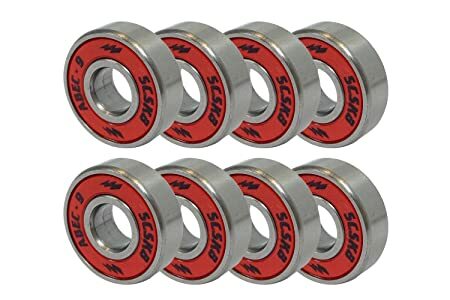 You can get these cheap bearings for just $5 for a pack of 8. In my opinion, they are the best deal that you can’t even ask for less value. Pretty casual huh? Let’s make one thing clear about the best skateboard bearings. There is a big myth here! The ABEC ratings won’t contribute much to the overall quality of any bearings. The ABEC only indicate the accuracy of these bearings in a manufacturing sense. Yet, higher ratings don’t mean those bearing is going to last long or perform well. Most ABEC-7 or 9 can spin between 20 up to 30,000 RPM. With 54mm wheels, these bearings can turn 20,000 RPM. This is equivalent 127 miles per hour. Even a professional competition does not need to go that fast! Most skatings happen under 30 miles per hour. This makes the rating starts to be redundant and impractical. So don’t be easily misled by a seller who keeps pushing you to buy a higher ABEC rating bearings. These combines make the best bearings. If you as a consumer who doesn’t have much technical knowledge about these, don’t worry I will help you with a rule of thumb. Pick those bearings that match your budget (preferably higher price), have good reviews (like mine) and from those famous brands. ABEC-1. Cheapest bearings have low accuracy and massively produced. Likely low quality too so best to avoid those. ABEC-3. The price might be similar or slightly higher, they still don’t give you a good riding experience. Also should avoid! ABEC-5. General bearings accuracy. They are good enough to do basic tricks and cruising. Fit well for most affordable skateboards. ABEC-7. Typically fast and smooth bearings. Offer great speed that most skateboarders satisfied. Of course, the price is likely to be higher than level 5. ABEC-9. The highest of rating, some brands even claim up to 11 but they are likely 9. These are the best pick for professional and those skateboarders demand more speed. Now, here you can find answers to frequently asked skateboard bearings related questions. If you want to make bearings spin faster and work efficiently, the only answer is to clean them frequently and adding new lube depending on how much you skate. Don’t worry I have a guide on cleaning your bearing right below! One of those shields are down, you can attach the bearings into a cleaning bottle. This bottle is specifically made to clean bearings. Make sure you ask your seller to have one. Third of all, only use solvent cleaning liquid and avoid using any flammable liquid (like petrol or gasoline) to clean the bearings. Use the cleaning bottle, uncap it and put the bearings on the metal bar and slightly tighten the screw. Make sure you only pour the cleaning liquid at ¼ of the bottle volume. Cap the bottle and shake it for about 20 seconds. Lastly, you can get the paper towel, open up the bottle, get the bearings out on the towel to dry it. Now you can put the shield back to the bearings and you are done! An average bearing should cost between $15-$30. Usually, the higher quality materials and more features mean the higher price. The answer is still depending on what you want to have. Here are some strong features of each type for your consideration. The pros of one type are the cons of the other type and vice versa. Since there are several types of shields, I will help you with the specific. Use a slim pin or needle to poke in the outer ring where you can see a small opening or a gap. As your pin or needle touch the seal ring, you will notice it as it starts turning, poke it out and lift it to the side. Until the date I wrote this article, Bones still hold the first place for fastest bearings in the world! ABEC ratings do not contribute or affect much on the performance of the bearings. They are for industrial and manufacturing reference on how much precise the bearings are made in term of accuracy. Having said that, you should be fine to have ABEC-7 and plus for good bearings. Also, read some reviews or do research on the brands and product descriptions before making any purchase.